We do hope you are all having a jolly good start to the week? Well... After a really fun time filming our first video blog post and having a very positive response from you all, we're back with our second instalment of "In Bed With Boys & Bunting!!" 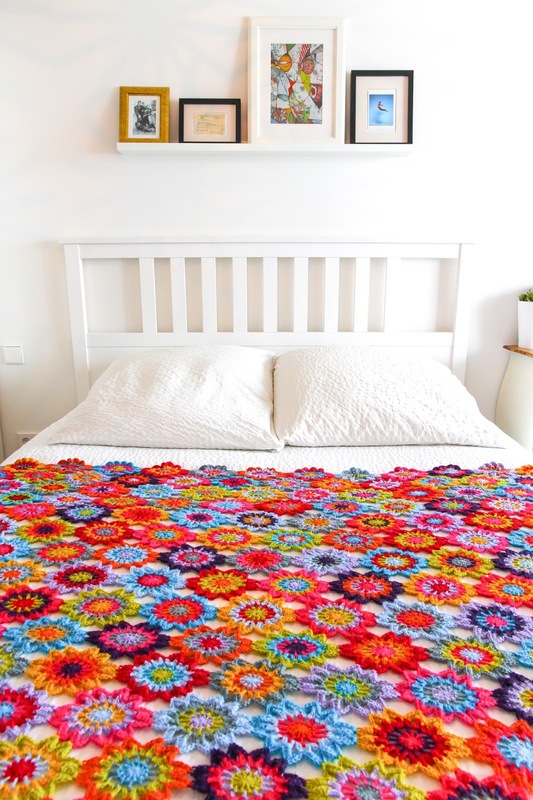 So pop the kettle on, put your feet up (or come join us in bed) and let's spend a little quality time together as we talk through our latest makes and have a good ol' chin wag with you all! In true yarnaholic style, Matt has gone and purchased himself some MORE yarn!! This time it's Peer Gynt, from a Norwegian company Sandnes Garn. This company produces some gorgeous yarn, in amazing colours! Well worth having a peep at the website! 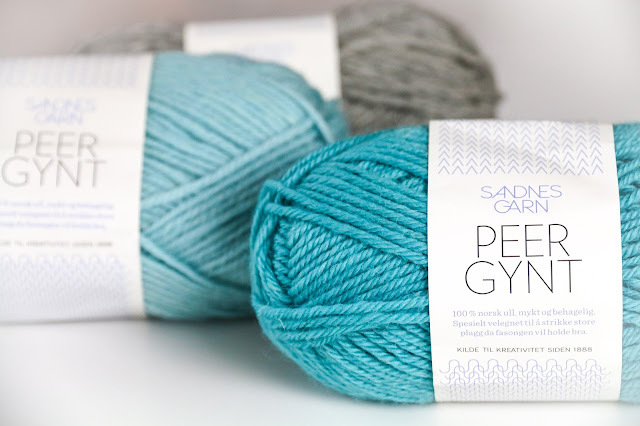 Matt has chosen a gorgeous turquoise, a minty blue and a cool grey from this line of superwash wool. 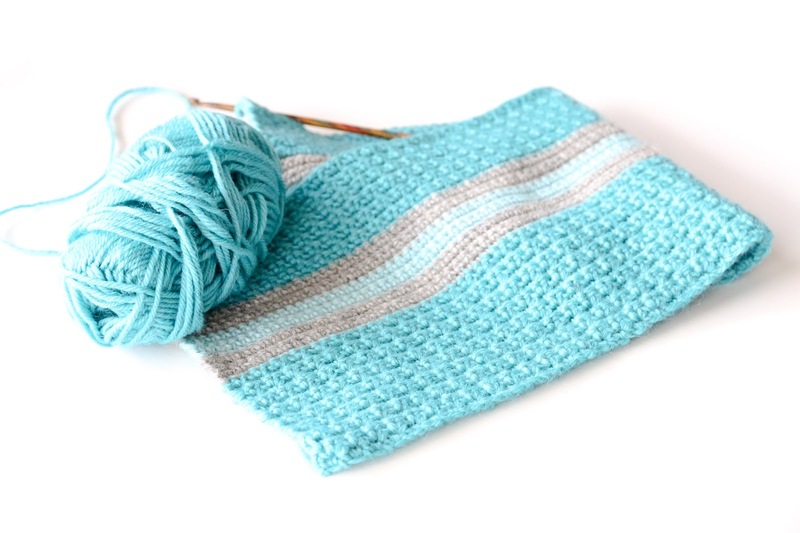 He's working on a baby blanket and having a play around with some pattern ideas. Here’s our “creepy” little bunny (a smaller variation of this bunny). She's actually quite cute but there’s just something a little bit ‘off’ about her. What do you think? Candle making has been so much fun! 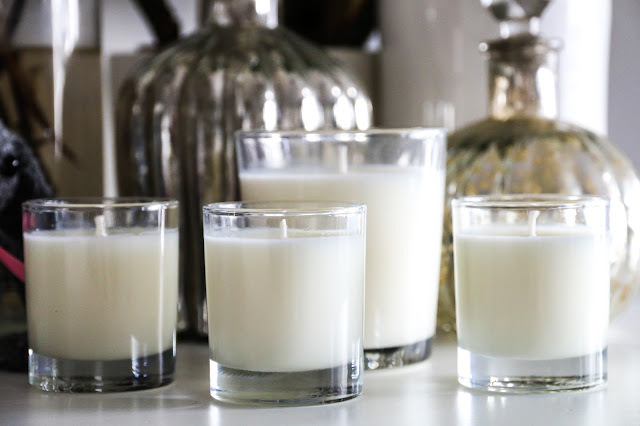 It literally takes about half an hour or less, plus the wait for your candles to solidify. You can choose whatever perfume oil you like and make them big or small. If you have any questions, don’t hesitate to ask us on our Facebook Page. 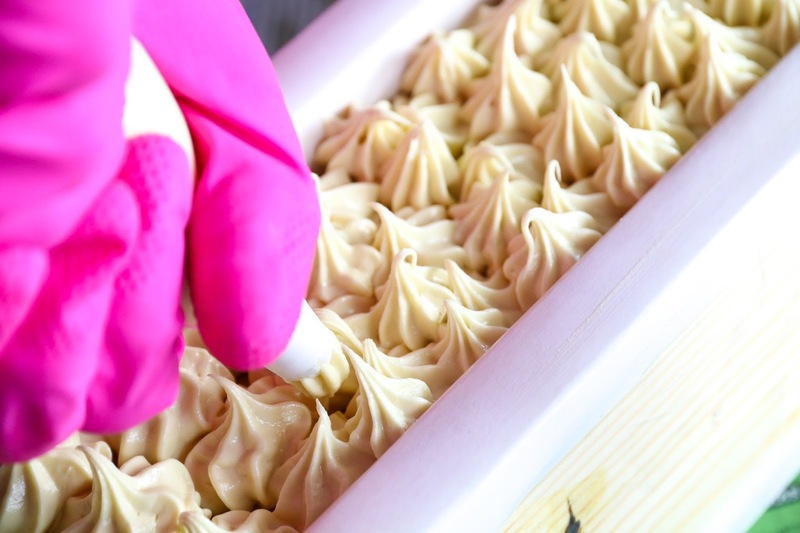 Here you can see how we piped our Lemon Meringue Soap! We had to wait quite a while for the soap batter to get thick enough to pipe, but the results were worth the wait! We could probably take some piping lessons, but a little bit of clumsiness adds to the homemade feel of it, or at least that’s what we tell ourselves ;-). Our cute little pooch Poppy, is a Bolonka Zwetna. She's 10 months old, of which we've had her for 8. We love her fun personality and the companionship she brings, plus there's nothing like waking up to this ball of energy in the morning! We couldn't live without her!! 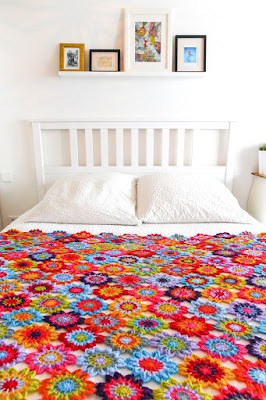 Our Japanese Flowe Blanket is one of our most prized possessions. We love how bright and colourful it is, the lovely luxurious alpaca yarn, but above all, we love the fact that we made it together!! 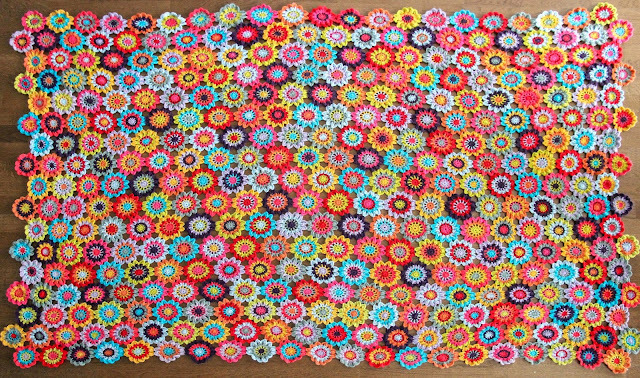 Here's a link to the original post that Matt wrote back in 2014, you'll find all of the details for the blanket here! We hope that you enjoyed our second instalment of "In Bed with Boys and Bunting"?! If you have questions that you would like to see featured in future episodes then simply send us a quick note. Also if you like what you're seeing in our Youtube videos, don't forget to subscribe. This way you'll be notified when we next upload a vlog episode or tutorial. Hey Elke!!! Thanks for the lovely message! I was also sad to stop writting over at according to Matt, but really wanted to move in a slightly different direction and I knew that I didn't have the time to manage both blogs. I love you guys & I love this video series! Keep 'em coming! 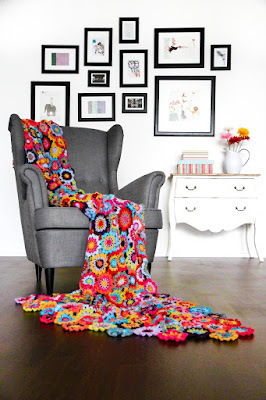 For your shop: In addition to the crochet/knit pieces and patterns that you could sell... maybe consider curating a little collection of home decor pieces, small art pieces, stylable things like we see in the photographs of your amazing home? 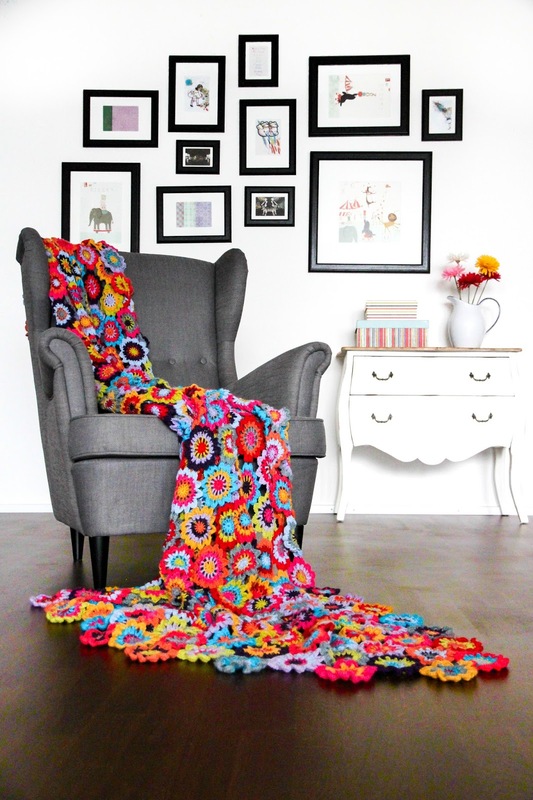 I love the way you guys blend the crochet into your home, it definitely inspires me to do the same. You guys have great style, and I think a curated collection (seasonal?) or something like that would be really fun, and also something you could feature on your blog? Just an idea. Love it. Regret dearly that I only just stumbled upon According to Matt last month to find it had been canceled. Have loved going through your old posts but think you've done it one better now combined. This blog is now my top favourite and would be sad to see the blogs cut too short. You do it well with questions at the end and feel if ppl don't want to sit through the whole blog (personally think shame on them) it's easy for them to leave after your main segments. 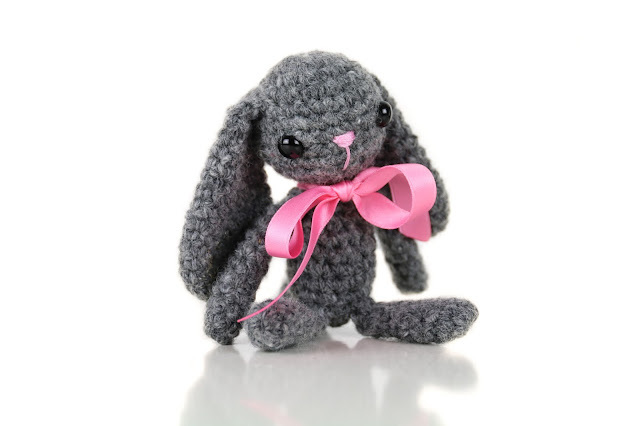 Personally I think they are amazing and like Denis have been learning to crochet online with the difference being I have been learning from you guys, that crochet library is very informative and well done. Hey Jodie!! Thanks for the message! I was sad to stop working on According to Matt, but knew that I couldn't manage to work on both blogs. I am in the process though of updating all of my old "according to Matt" posts and will have a little section on Boys & Bunting. I thought that this was a good way of not wasting all of the pictures and ideas I've had over the years. It's great to hear that you have taken a look at our Library! We worked very hard on it and our very proud. It's nice to know that it is being used. Your lovely Poppy looks like a sister of my dog Trixie who is a Havanese. Tribe is 8 pounds and very fun. Best wishes to you for a long and happy life together with Poppy! Hey Dawn!!! I love Havanese as well! 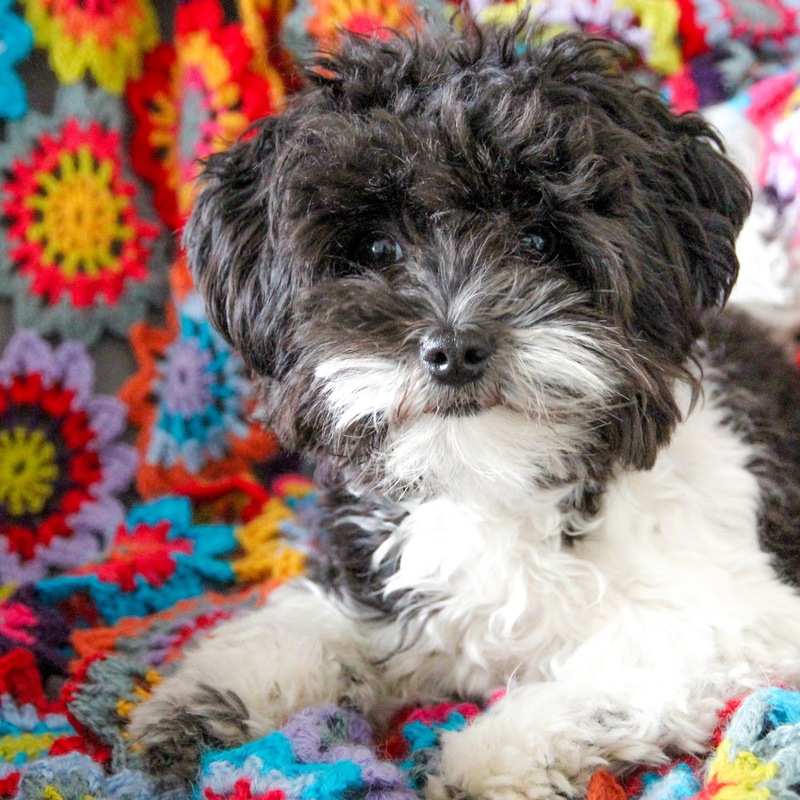 Bolonkas and Havanese are from the same kind of dog family, so that's why they look so similar! Thanks for leaving a comment and watching us! Lots of hugs and kisses for you and Trixie!!! !